By now, there has been so much coverage in ways of analysis on Rogue One: A Star Wars Story. Honestly, what’s left to talk about? The media, from news-sites to fan-sites, and every corner of the internet has turned this first Star Wars standalone film inside-out, and dissected it from every angle possible. But here, at Coffee with Kenobi, we do our best (by tradition) to take a closer look at even the tiniest of details, through what’s been noted as a critical lens. We do this in hopes to shine some light on possible new perspectives and ideas. Hopefully, I’ll be somewhat successful with what I’m bringing to the table today. As a connecting fan, I tend to look at the characters and their situations as chessmen on a chess board or as puzzle pieces, belonging to an intricate jigsaw puzzle. When they finally do fit together, a sense of clarity tends to wash over me and I’m like, “check mate!” It’s a beautiful thing, really, and it only intensifies my love for the galaxy far, far away that much more. 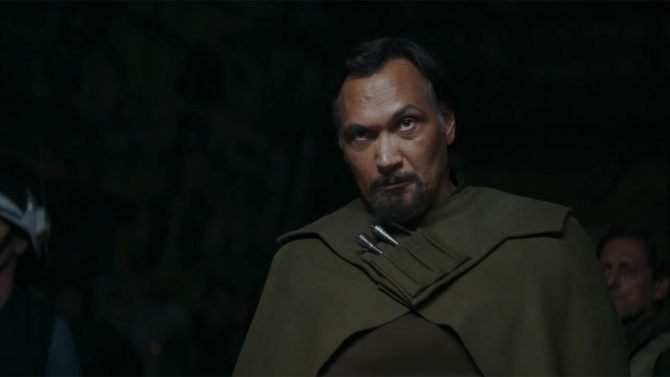 Now, all that considered, I’d like to take a closer look at what I consider to be prominent key moments for Bail Organa in Rogue One: A Star Wars Story. For me, these scenes are crucial when it comes to his character. Not to mention, these scenes from Rogue One are our last moments with Bail Organa. On that note, it’s quite surreal, isn’t it? By the time of Rogue One, Bail’s position in the Rebellion is in full force, pun intended. In my honest opinion, I doubt he can keep it a secret from the Empire any longer, and it’s presumable to think that they are nipping at his heels with every move or decision he makes at this point. So, when we see him emerge from the shadows on Yavin IV and come face-to-face with Jyn Erso for the first time, it’s quite symbolic of his character. This first meeting, he is attentive to the conversation, but he remains quiet. It’s as if he is there to offer her, Jyn, comfort while she is interrogated on the ins-and-outs of her father’s dealings with the Empire, and even doubly pressed on the whereabouts of Saw Gerrera. What I found to be so profound in this scene is that Jyn is being pushed to her limits on heart-pressing matters surrounding the two most prominent father figures in her life and then, out of the darkness, steps the man who has been readying the galaxy’s hope from birth. The man who has been waiting almost two decades for the right moment to set the wheels in motion, and here, now, he sees the cog within Jyn Erso. It’s a simultaneous reflection shared between a father, and a daughter from two different families, and yet, the moment speaks volumes. Well, it does to me. See, Jyn is being emotionally tormented by the Alliance in regards to her biological father, Galen Erso and her surrogate dad, the military extremist Saw Gerrera. So, it’s only fitting that Bail Organa, the adoptive father of Princess Leia, presents himself during this trying time. As a viewer, I found his presence to be soothing during this scene and I saw it as an intriguing parallel or angle, too. After all, Bail knows they are judging Jyn based on her father’s actions, and those actions should have no real relevance on who she is. Furthermore, he knows, had that been Leia standing there as they uncover her true-identity i.e. the daughter of Darth Vader, she wouldn’t have any chance for survival, let alone a pardon among the Rebel Alliance. Regardless, intended reflection or not, in the end, Leia will be the bait for Tarkin. He’ll have her indirectly decide Bail’s fate and in doing so, her entire homeworld of Alderaan becomes the first planetary testing ground for the Death Star. How tragically poetic. Great piece, Becca. I think Bail’s importance within the saga is often overlooked by many fans but glad to see that he’s finally getting his due in Rogue One as well as in Rebels, the Ahsoka novel, and Bloodline. Moving forward, I’d like to see Bail and/or Breha get their own novel or comic series. I’ve always wanted to learn more about their involvement in the Rebellion and it feels like we’ve only seen a few glimpses into their lives. After all, these are the people who helped shape Leia into the woman she became. Oh my gosh, Becca! How beautifully put! The first time I saw “Rogue One”, and witnessed Bail Organa stepping out of the deep, dark shadows of the bunker on Yavin IV, I got shivers — and let loose a (silent! 😉 ) whoop! I was thrilled to see him — for so many different reasons. Here was a man who was willing to put his career, his life on the line for something in which he truly believed, that he had stuck with the Rebellion for all those years. This fight was not some flash-in-the-pan jaunt for him back in the early days. He was committed. He was in it to stay, come hell or high water. Too, here was an individual who exuded calm — without sacrificing drive. That revelation you so astutely point out — about his stance as a father who looks at parenthood at least slightly different than most might — was something I had not considered before. But it makes so much sense. He saw the need to lend his quiet protection (perhaps?) to Jyn during her interrogation. I would imagine Bail was every bit as interested in learning whether the Rebellion could count on Jyn as the other Rebel leaders were, but you’re absolutely right. From his point of view, he could see Leia in much the same set of circumstances (had her biological parentage been known). As always, Becca, I enjoy reading what you have to say about all subjects of that galaxy far, far away. Thank you so much for sharing your insights with me, with us.